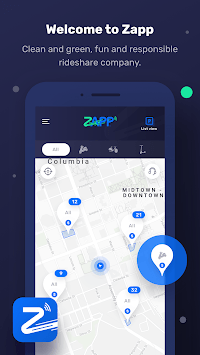 Locate, rent, start and ride Zapp electric cycles from our app on your smartphone. 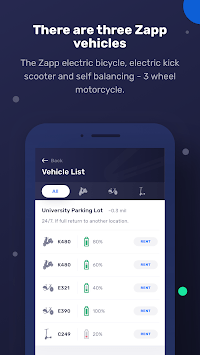 Pick up and drop off Zapp electric cycles at any of our many Zapp Pick Up/Drop Off locations around cities and college campuses. Zapp cycles are electric. Our special battery packs are efficient and powerful and our road crew swaps batteries everyday to ensure you always have the power to Zapp N Go! 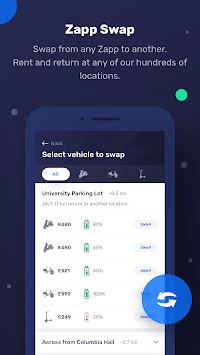 Zapp is changing the way people commute around cities and college campuses while reducing carbon emissions. Get out of your car, save money, gas, parking and have fun! All Zapps are equipped with Bluetooth speakers for voice navigation from your phone and to listen to your favorites tunes.